The Continental Indoor Football League (CIFL) was an indoor football league based along the Midwestern United States region that played nine seasons from 2006 to 2014. It began play in April 2006 as the Great Lakes Indoor Football League (GLIFL). It was formed by Jeff Spitaleri, his brother Eric, and a third member, Cory Trapp, all from the Canton, Ohio area. The league was originally called the Ohio-Penn Indoor Football League, but then executives decided to increase the league's appeal to the entire Great Lakes region. Initially, the league was relatively successful, having a cumulative attendance of over 75,000 in the inaugural regular season. However, the league, like other indoor football associations, was plagued by folding franchises and unenforceable policies throughout its existence. For example, the 2006 champion Port Huron Pirates were found to have been paying some of their players over the league salary cap. 2007 saw several teams fold during the season, and during the 2008 season, the league's most successful team, the Rochester Raiders, moved to another league due to frustration over the failure of the league to provide notice of an opponent's forfeiture, resulting in lost ticket and advertising revenue. The league also failed to return the Raiders' owners' emergency fund deposit, which was collected specifically to protect against such occurrences. 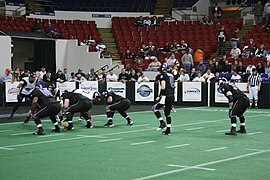 The CIFL is among several indoor football leagues that maintained a mostly regional operation, with most of its teams clustered in the Midwestern United States. Teams went back and forth between the CIFL and the other regional leagues, as well as the Indoor Football League (a national league of similar caliber), over the course of the league's history. Prior to its disbanding, the CIFL claimed itself to be the longest continually operating current indoor football league in the United States, noting that older leagues such as the Arena Football League and American Indoor Football had suspended operations at least once since the CIFL's founding. In July 2012, the CIFL changed ownership for the first time in its history, when Jeff Spitaleri sold the CIFL to Indoor Football Incorporated, which included Rob Licht, Jim O'Brien and Stuart Schweigert. The group also owned the Saginaw Sting. The new ownership of the league sought to help current teams brand their product better, as well as look to expand the league, but its primary goal was to have competitive franchises. The Great Lakes Indoor Football League was founded in 2005 by brothers Eric and Jeff Spitaleri and their friend Cory Trapp. The league's first franchise accepted was the Lehigh Valley Outlawz, who joined in late June, 2005. During the league's first season, it cost a new owner a $15,000 franchising fee, with a capped salary of $5,400 per team, per week, with no player earning more than $300 per game. While trying to attract teams, the league agreed to arena contracts before securing owners in efforts to attract owners in those specific market areas. They reached agreements with markets in Danville, Illinois, Battle Creek, Michigan, Rochester, New York, Port Huron, Michigan, Toledo, Ohio and Marion, Ohio. Of those markets, the league was able to sell ownership to four of them. In December, it was finalized that the league would begin with six teams in their inaugural season, with teach team playing a 10-game season over a 12-week span. On April 7, 2006, the league held its first ever games with the Battle Creek Crunch hosting the Port Huron Pirates and the Rochester Raiders hosting the New York/New Jersey Revolution. The Crunch were defeated 62-22 by the Pirates, and the Raiders defeating the Revolution 71-13. The league's first ever playoff format was a 4-team set up with the #1 seed hosting the #4 seed, and the #2 seed hosting the #3 seed. The semifinals featured a pair of blowout games, with Port Huron and Rochester advancing to Great Lakes Bowl I, which was to be played at McMorran Arena as Port Huron was the #1 seed on July 22. The Pirates were able shut down the Raiders' offense for most of the second half earning a 40-34 victory for the Port Huron, thus completing the first ever undefeated season in league history. At the conclusion of the first season, the league also put together an All-Star Game at Stabler Arena, where they split up three teams each for an East vs. West matchup. The West dominated, with a roster full of Port Huron's championship team. The 2007 season brought big changes, as the league changed its name to the Continental Indoor Football League, and saw the league expand to 14 teams with only the Crunch not returning. The league suspended operations in October 2014, when the league's five remaining teams, the champion Erie Explosion, the Saginaw Sting, Marion Blue Racers, Chicago Blitz and Northern Kentucky River Monsters, either suspended operations or joined other leagues. Shortly thereafter, the league Web site redirected to American Indoor Football's. On August 23, 2015, it was announced that the CIFL would return for the 2016 season (playing an interlocking schedule with another proposed league, Supreme Indoor Football, as part of the Indoor Football Alliance) and the Explosion, Sting and Blue Racers will return to the CIFL as a result. However, the league effectively disbanded again later that fall after no other teams agreed to join the revived league; the Blue Racers and Sting joined American Indoor Football, and the Explosion eventually announced they would not play in 2016. The DCU Center during a 2007 New England Surge game. Field Size – 50 yards long by 25 yards wide, with end zones a minimum of 5 yards in depth. Fields may vary in size due to physical constraints within facility, with CIFL permission. End zones may be rounded due to hockey board configurations. Padded dasher board walls around the entire field that act as an extension of the ground (only "out of bounds" if contact made by opposing player that forces player into the dasher wall, much like a 'down by contact' rule). Goal Posts – Goal posts are 12 feet (3.7 m) from the floor to the crossbar. The crossbar is 10 feet (3.0 m) in width. Anything used to hang the goalpost is considered a part of the upright. Number Of Players – Eight players per team on the field at one time. Starting in 2013 teams will be allowed to expand their active roster from 19 players up to 21 this year and are being required to carry a backup Quarterback and Kicker. In the league's earliest seasons, the GLIFL/CIFL played with only seven players on each side, one less than the standard eight used in other football leagues. Playing Time – Four 15-minute quarters with a running clock. Clock only stops for incomplete passes and out of bounds plays during the final minute of the second and fourth quarters. 25-second play clock. Scoring – 6 points for TD, 2 points for run or pass conversion, or drop kick PAT, 1 point for place kick PAT, 2 points for defensive conversion following TD, 2 points for safety. 3 points for a field goal, 4 points for a drop kick field goal. Teams will score a single point on their kickoff if the ball makes its way through the uprights. Defensive Linemen – There must be three defensive linemen, and they must line up on the nose, or can line up inside foot-to-outside foot outside of an offensive lineman. Linemen must rush inside if nose up or slanted into if shaded, and they must make contact before any movement to the outside is made. Linebackers – At least two defensive players must line up at least 5 yards behind the line of scrimmage. The other two non-linemen must either line up face-to-face with an offensive non-lineman on the line, or be five yards behind the line of scrimmage. After the snap, this rule is eliminated and the players can roam anywhere they wish, provided it doesn't violate blitzing rules. Linebackers can line up at the goal line if the offense is within five yards of scoring. Kickoffs – If a kickoff leaves the field of play on the fly, the ball comes out to the 25-yard line. The sideline walls and end zone walls are not out of bounds, and balls can be played off of them. If a kickoff leaves the field of play after making contact with the field or a player on either team, the ball comes out to the 5-yard line, or the point in which it leaves the field of play, whichever is closest to the kicking team's goal line. Co-ed play – Two female placekickers, Katie Hnida and Julie Harshbarger, have played for the CIFL. Excluding all-female leagues, the CIFL is one of only three professional football leagues (the Atlantic Coast Football League in 1970, the Indoor Football League in 2014) to have hired female players; the CIFL is the only league to have hired more than one, and the only one to have allowed its female players to score points. a 6-team single-elimination playoff beginning in April, culminating in the CIFL Championship Game in May. Traditionally, American high school football games are played on Friday nights, American college football games are played on Thursday nights and Saturdays, and most NFL games are played on Sunday. Because the CIFL season is played at a different season than the high school, college and NFL seasons, the CIFL schedules Friday, Saturday, Sunday and (new for 2013) Monday games. During mini-camps in the winter, CIFL teams typically play one-to-two exhibition games from early January through early February. Each team is free to schedule these games, but all games must be approved by the league. No games are allowed within one week of the team's first regular season game. The games are useful for new players who are not used to playing indoor football. Following the preseason, each of the ten teams embark on an twelve-week, ten-game schedule, with the extra weeks consisting of a bye to allow teams a rest sometime in the middle of the season. According to the current scheduling structure, the league schedule will be designed to minimize travel costs and create games that maximize the competitive advantages of each game as possible. Failure to provide the appropriate number of dates to the league office will have a significant outcome on the type of schedule a team receives. The league would like to release the schedule by October 1 of each year. Each team plays 6-to-8 of the teams in the league, with the leftover number of games scheduled against teams already played. Each team will play 5 home games and 5 road games. The CIFL regular season consists of a schedule of 10 games for each team. This allows for travel teams to play all their games on the road, and gives every team in the league an extra home game for each travel team in the league. Although this scheduling formula determines each of the ten teams' respective opponents, the league usually does not release the final regular schedule with specific dates and times until the winter; the CIFL needs several months to coordinate the entire season schedule so that, among other reasons, games are worked around various scheduling conflicts. The CIFL has gone through many numbers of teams, so the playoff format has changed several times throughout the years. In the league's first season, 2006, the playoff format featured a 1-4 seed based on their W-L-T records. The one seed hosted the four seed, and the two seed hosted the three seed. The winners advanced to the Great Lakes Bowl I, and the highest remaining seed hosted. Due to expansion in 2007, the playoff format was expanded to eight teams making the playoffs. The top team in each division would clinch homefield advantage throughout the playoffs. The rest are Wild Card teams that are seeded second through fourth. From that point the matchups would remain the same as the previous year, with the exception that the winners of each divisional playoff would meet in the CIFL Championship Game. In 2009, the league returned to its original format of a four-team playoff. This stayed in place until 2012, when the league decided to just have the regular season first and second seeds meet for the Championship. The league put on an All-Star game once, in its inaugural 2006 season. In its early years, the CIFL was a very unstable and somewhat informal organization. Many teams entered and left the league annually, with the worst instance of teams exiting occurring when the new Indoor Football League was formed and the league lost five teams. The league fielded at least six teams in each year of its existence, gaining and losing teams each year from both expansion and teams shifting leagues. The Saginaw Sting was the franchise with the most time in the league; they completed their fourth season at the end of 2014. The Erie Explosion was the league's oldest team; it has been in operation since 2007 and joined the league in 2013. It was speculated that there would be a potential for a merger with the American Professional Football League in 2013, but this never came to fruition; likewise, a proposal to form an Indoor Football Alliance between three former CIFL teams and an upstart "Supreme Indoor Football" league for 2016 also collapsed. Moved to the Indoor Football League - Note the Raiders had originally gone to the AIFA. The league took over operations and ceased for failure to meet league requirements. The league does not have its television rights sold to a network, such as the Arena Football League with the CBS Sports Network. Individual teams are free to work out deals with their local affiliates to broadcast their games. Each CIFL team usually works out its own radio network deal with local stations, and the stations employ its announcers. Nationally, the CIFL is heard on the CIFL Radio Network, which can be used online via the CIFL GameCenter on the league's website. In 2010, the CIFL introduced the CIFL GameCenter which allows statisticians wired to into the CIFL Network. As they use the stat software to record the game, it is updated live in the GameCenter. Milwaukee Bonecrushers' quarterback Ryan Maiuri taking a snap against the Chicago Slaughter in 2008. Base player salaries must be no less than $50 per game and no more than $200 per game. There are no win bonuses since the 2010 season, as agreed at the owner meetings. For the 2010 season, the weekly team salary cap was $3,000 per week. Any team in violation of the salary cap will be fined and could have either players suspended for the season or forfeiture of games in which they violated the cap. Since then, the league has changed to a weekly salary cap of $2,500 per week, with every player making anywhere from 50 to 200 dollars in a single game. ^ "Home of the Continental Indoor Football League". CIFLFootball.com. Retrieved March 18, 2011. ^ "Rochester Raiders To Withdraw From CIFL". Our Sports Central.com. OurSports Central. June 8, 2008. Retrieved September 22, 2008. ^ a b Steve Jones (September 5, 2012). "Kentucky Xtreme plans to bring arena football back to Freedom Hall". Courier-Journal. Retrieved September 7, 2012. ^ a b Mancina, Greg (September 12, 2008). "Saginaw Sting ready to join new league while owners work to split their differences". The Saginaw News. Saginaw, Michigan: Booth Newspapers. Archived from the original on January 3, 2013. Retrieved October 16, 2008. ^ Kyle Austin (July 10, 2012). "Saginaw Sting ownership group buys Continental Indoor Football League". www.mlive.com. M Live. Retrieved July 11, 2012. ^ Stacy Clardie (June 20, 2009). "League's founder enjoys challenge of running CIFL". www.journalgazette.net. The Journal Gazette. Retrieved January 2, 2014. ^ "GLIFL announces first franchise". www.oursportscentral.com. OurSports Central. June 29, 2005. Retrieved January 2, 2014. ^ Jay Hart (April 21, 2006). "Lehigh Valley Outlawz want to steal fans' hearts.Can they do it?". www.mcall.com. The Morning Call. Retrieved January 2, 2014. ^ "GLIFL reaches arena agreements". www.oursportscentral.com. OurSports Central. June 30, 2005. Retrieved January 2, 2014. ^ "More arena agreements announced". www.oursportscentral.com. OurSports Central. July 15, 2005. Retrieved January 2, 2014. ^ "GLIFL Conducts First Owners Meeting". www.oursportscentral.com. OurSports Central. December 12, 2005. Retrieved January 2, 2014. ^ "Crunch Lose Opener to Pirates". www.oursportscentral.com. OurSports Central. April 8, 2006. Retrieved January 2, 2014. ^ James Johnson (April 8, 2006). "Raiders roll to big-time victory in their debut". www.democratandchronicle.com. Gannett. Retrieved January 2, 2014. ^ "GLIFL Playoffs Round One Preview". www.oursportscentral.com. OurSports Central. July 7, 2006. Retrieved January 2, 2014. ^ "GLIFL Playoffs Round One in Review". www.oursportscentral.com. OurSports Central. July 12, 2006. Retrieved January 2, 2014. ^ "Pirates finish undefeated campaign with 40-34 win". www.oursportscentral.com. OurSports Central. July 23, 2006. Retrieved January 2, 2014. ^ "West All-Stars win GLIFL All-Star Game 49-17". www.oursportscentral.com. OurSports Central. August 7, 2006. Retrieved January 3, 2015. ^ "CIFL Looks at Past, Towards Future". www.oursportscentral.com. OurSports Central. October 16, 2006. Retrieved January 2, 2014. ^ Randy Snow (December 20, 2006). "2006 Football Year in Review". www.oursportscentral.com. OurSports Central. Retrieved January 2, 2014. ^ Joseph Hayes (November 25, 2014). "CIFL folds, Patriots future uncertain". www.thetimesherald.com. The Time Herald. Retrieved November 26, 2014. ^ "Supreme Indoor Football and Continental Indoor Football League Join Forces". OurSportsCentral. August 23, 2015. Retrieved August 24, 2015. ^ "Erie Explosion Suspend 2016 Football Operations". Our Sports Central. January 18, 2016. ^ a b c d Aaron Black (October 26, 2012). "CIFL Concludes Annual Meeting, Sets Vision for Future". www.oursportscentral.com. OurSports Central. Retrieved October 29, 2012. ^ Hayes, Reggie (March 31, 2010). "FireHawks' new kicker rekindling her dream". The News-Sentinel. Archived from the original on March 11, 2012. Retrieved November 3, 2010. ^ Marc Correnti (June 26, 2010). "Harshbarger gets her kicks". Beloit Daily News. Retrieved June 19, 2012. ^ "CIFL Releases 2013 Regular Season Schedule". www.ciflfootball.com. Continental Indoor Football League. Retrieved November 12, 2012. ^ a b c d e "2010 CIFL Operations Manual". Retrieved January 12, 2012. ^ Kyle Austin (May 11, 2012). "CIFL shortens playoff format, put Saginaw Sting in league title game". www.mlive.com. M Live. Retrieved June 19, 2012. ^ Joseph Hayes (October 2, 2012). "Joseph Hayes: CIFL adds teams, headed in right direction?". The Time Herald. Retrieved October 11, 2012. ^ Joseph Hayes (November 23, 2011). "Continental Indoor Football League making much-needed changes". The Time Herald. ^ Nilsen, Dan (June 8, 2008). "Flint Phantoms forfeit CIFL finale; opponent quits league". Flint Journal. Booth Newspapers. Archived from the original on June 10, 2008. Retrieved June 9, 2008. ^ "Indoor Football League Invites Five Teams To Join; 23 Teams Now In League". oursportscentral.com. Our Sports Central. September 12, 2008. Retrieved September 22, 2008. This page was last edited on 24 February 2019, at 09:10 (UTC).